Explore Ötztal’s countless highlights with the ultimate Ötztal Premium Card. 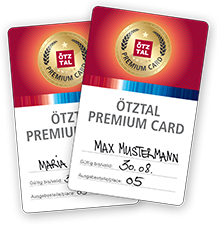 Take full advantage of all Ötztal Premium Card services from the day after your arrivel. You enjoy free use of all public bus lines and summer mountain lifts throughout the Ötztal valley. Additionally, you can take part in guided hiking tours or explore the Ötztal on a mountain bike including MTB rental. Afterwards you regain your strength at one of Ötztal’s public pools and swimming lakes, at Freizeit Arena or Aqua Dome Spa Center. Unlimited action is guaranteed in the AREA47 featuring also a swimming lake and many attractions included in the Ötztal Premium Card. A visit to the Ötzi Village or other splendid museums is also a must before you end your holiday with a minigolf match or fun-filled hours at the Fun Park. With the unique Ötztal Premium Card you save money from the day you arrive at our hotel. The Ötztal Card is available for 3,7 or 10 consecutive days.